October 1960 floods aftermath 5mb WMV BBC Creative Archive. 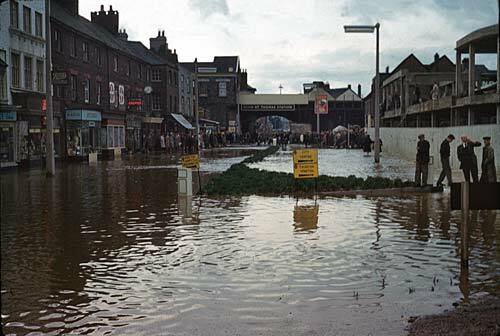 Starting the flood defences 1964 3.5mb WMV BBC Creative Archive. 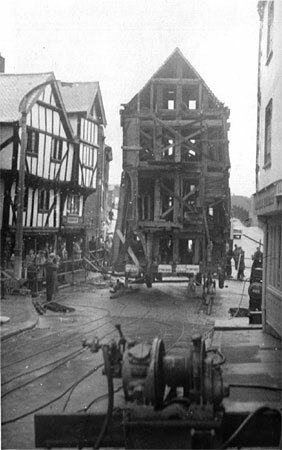 The House that Moved 1961 9.5 MB WMV BBC Creative Archive. Building the Northern Exe Bridge 12mb WMV - filmed in colour by Peter Werran between 1967 and 1970. 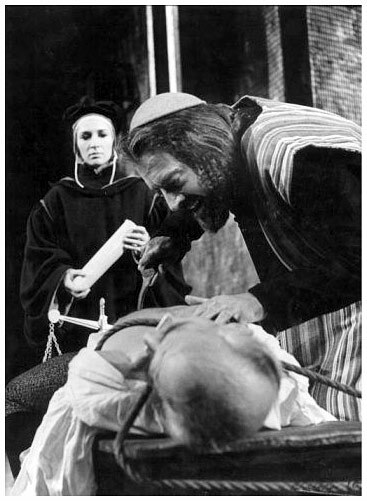 The Postgraduate Medical School was established in 1962. 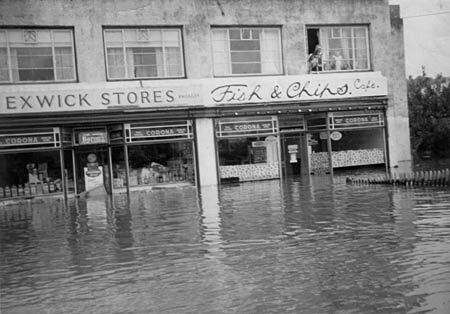 On 3rd December 1960 much of Exwick through to St Thomas was flooded for the second time in 5 weeks. In 1966, Alphington, Pinhoe and Topsham were incorporated into the city boundary. The Big Freeze of 1963 The bad winter started just after Christmas 1962. Over the next few weeks, Britain suffered blizzards, record low temperatures and travel havoc caused by snow. The Express and Echo reported on the freeze - here are some highlights. 5 January 1963 - the temperature hit -7.9° Celsius. A photo caption reads - "General Buller's statue in Exeter, looking more like Napoleons retreat from Moscow." 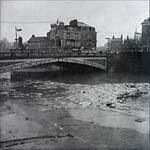 11 January 1963 - "Ice Blocks Exeter Canal" - it was reported that the canal had been blocked with 6 inches of ice since just after Christmas. Boats owners were advised to stay put. 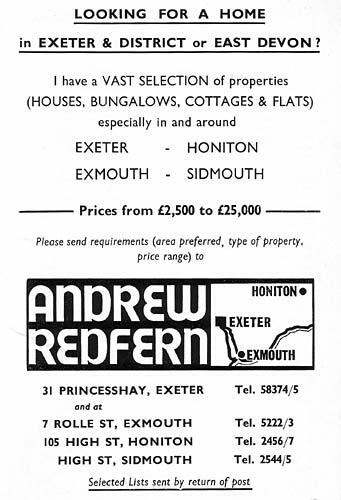 19 January 1963 - "Exe Worst Freeze for 10 years". 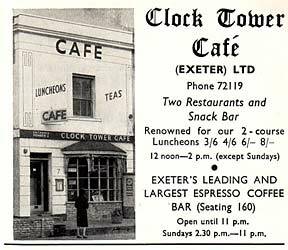 21 January 1963 - "Power Overload Hits Exeter". Engineers work to replace blown fuses in substations in Beacon Heath, Polsloe, and St Thomas. 2 February 1963 - "More Blizzards, Road Conditions Worst of Winter". 6 February 1963 - "Flood Alert for Devon". Widespread flooding caused chaos. The snow of 1962/3 cut off many rural areas, requiring helicopters to drop supplies and feed for the animals. 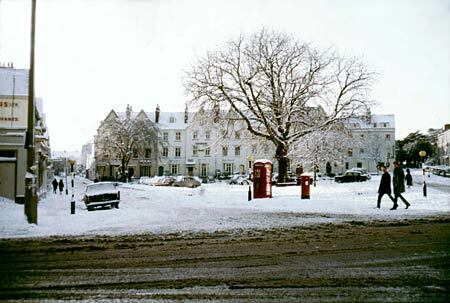 In Exeter, the snow was substantial and lasted for weeks. The top photo shows Bystock Terrace and car park, while the photo bottom shows the Pennsylvania Cricket Pavilion in the snow. 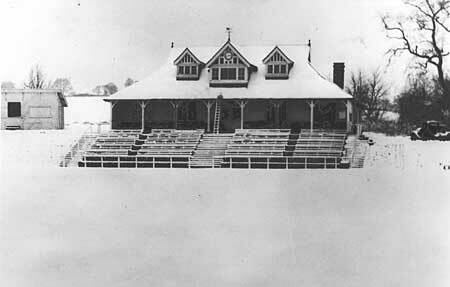 Photo of Bystock Terrace, Alan H Mazonowicz and of the pavilion Phil Hoare. 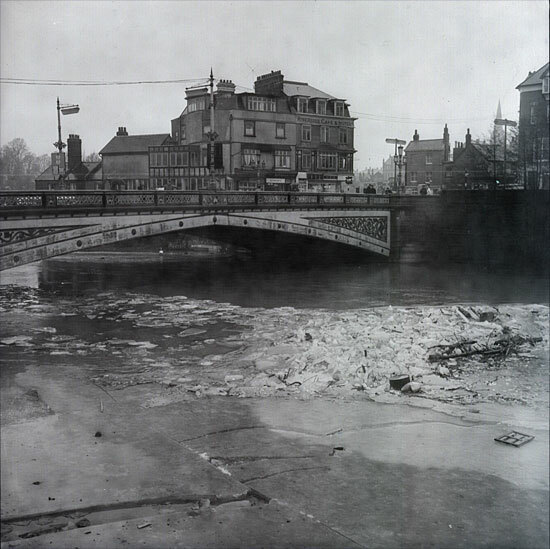 From the orginal negative, this photo shows the canal during the 1962/3 winter. Not only is the canal frozen over, but Exminster Marsh is also a sheet of ice. Also see the Walking on Ice video. Ice and debris flows beneath the Exe Bridge, while in the foreground, huge rafts of ice are gradually breaking up. From the original negative. 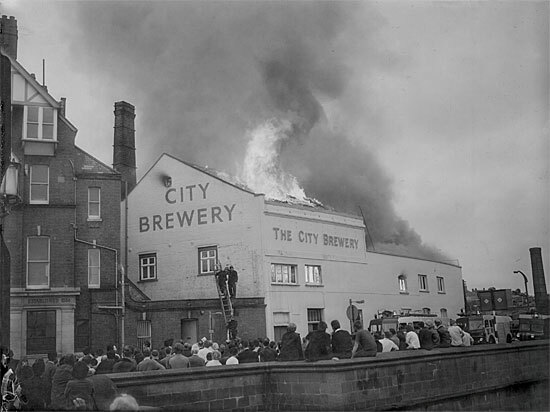 This photo, from an original glass negative shows fire fighters tackling a blaze at the City Brewery. 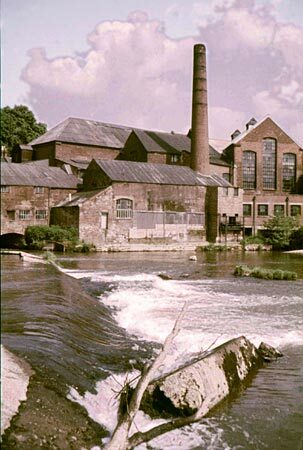 The brewery had closed, months before, after Norman and Pring were taken over by Whitbread in 1962. Investigators discovered that sparks from oxy-equipment that was used to cut up the steel vats set fire to the roof. The damaged building was demolished soon after. 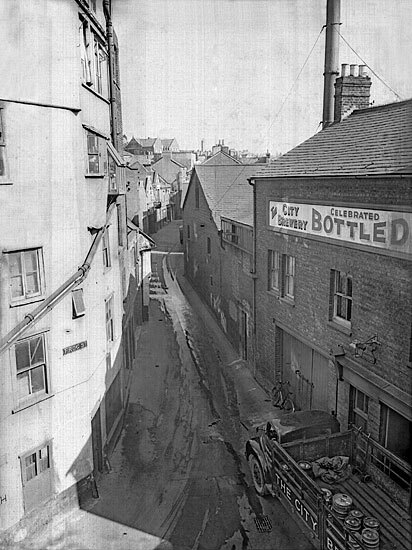 Also from a glass negative, this photo shows Frog Street from New Bridge Street. The Frog Street tunnel is just beneath. The bottle store for the City Brewery is on the right, behind the brewery building in the previous photo. 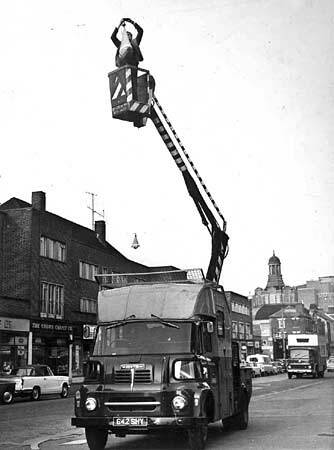 Putting up the Christmas lights on 3rd November 1966. This was when the South Western Electricity Board (SWEB) did this task. The worker on the lift platform was Roger Mitchell, who provided the photo. Roger was a second year apprentice with SWEB, who had to pose for the photo. He was given the task every year because of his 2m height. 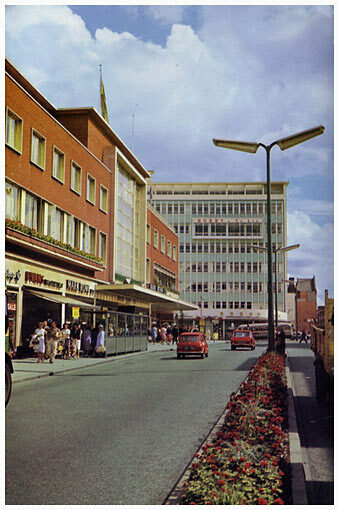 The rebuilding of Eastgate was completed in 1960 and Princesshay was completed in 1962. The northern Exe Bridge was opened in 1969. 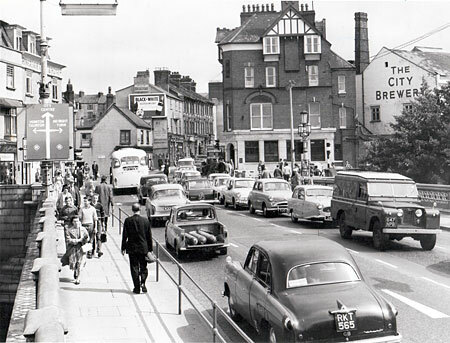 The southern bridge in 1972. 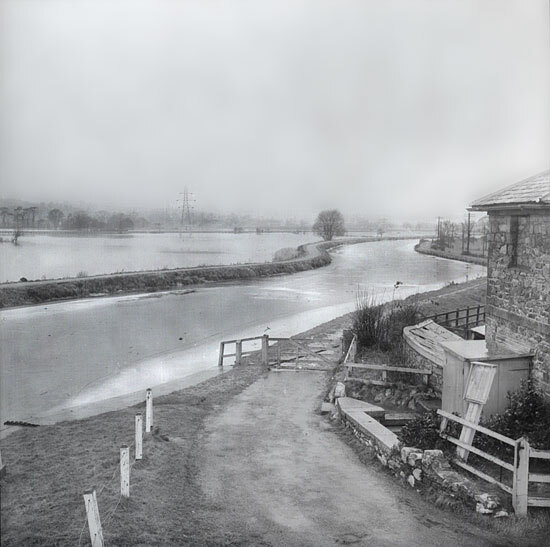 Construction of the flood prevention scheme commenced in September 1964. 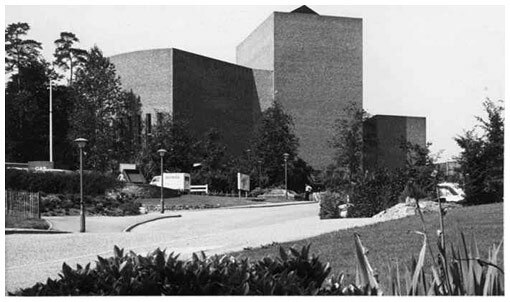 It was completed in 1979. 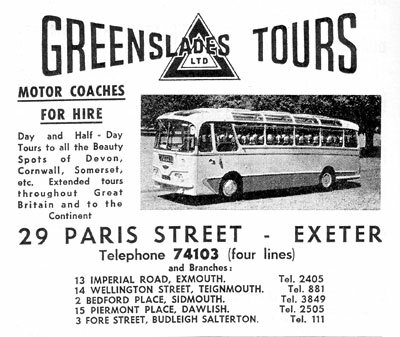 In 1969, Greenslades were taken over by Western National. These two adverts both date from 1967 - one from the City Guide and one from Kelly's Directory. 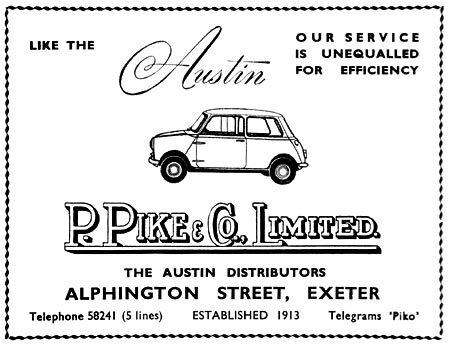 Situated in Alphington Street, Pikes were established in 1914. By 1961 they are now selling the favourite, Austin Mini. The bus station at Paris Street was built in 1963. It moved from the corner of Paul Street and Queens Street. 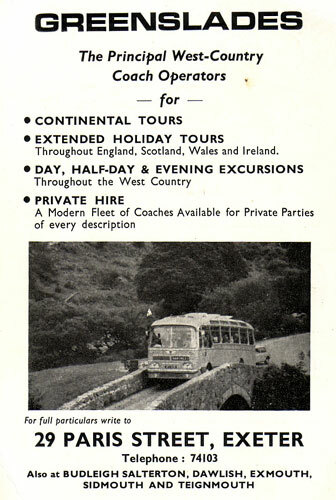 By 1964 the lower parking area was full of long distance holiday coaches visiting Exeter. The Frog Street underpass, under New Bridge Street was completed in 1963. 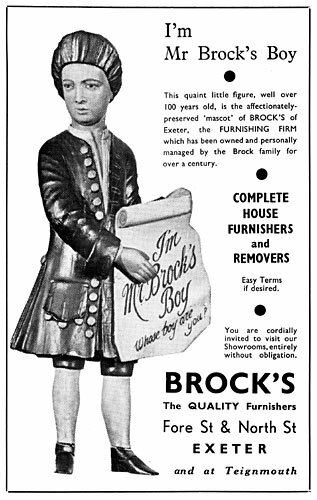 William Brock The old family firm of William Brock have been trading since 1826. 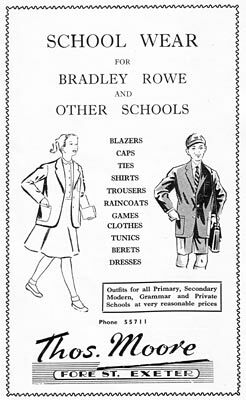 There are examples of their adverts from previous decades. Here, the firm have adopted a figure as a logo. 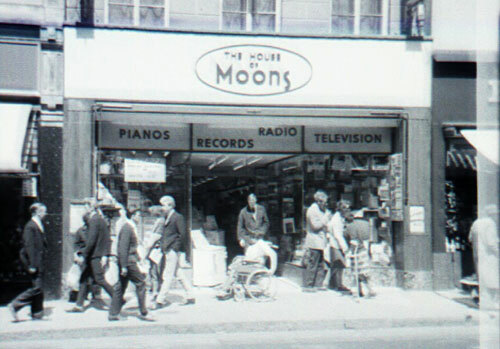 During the 1960s, Exeter's youngsters would buy their 7" singles from Moon's in the High Street. 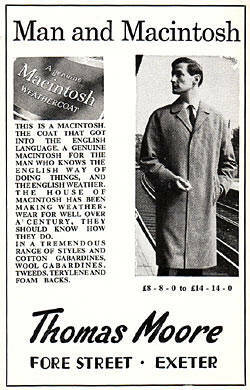 Situated next to Woolworth's - ironically now HMV - Moon's also sold domestic appliances, white goods and TV's and radios. You could even rent a piano overnight for a gig in a village hall or pub. Photos courtesy of Lydia Barnard. Two adverts for Thomas Moore - the first from 1962 and the second, 1967. One of only two old, established businesses in Fore Street to be still trading, Thomas Moore opened in 1907. 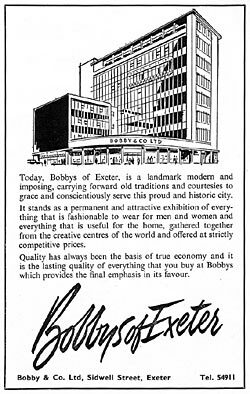 Bobbys is instantly recognisable as the old Debenhams that closed in 2007 - the store was constructed in 1964 on the bomb ravaged corner of Sidwell Street and Longbrook Street. 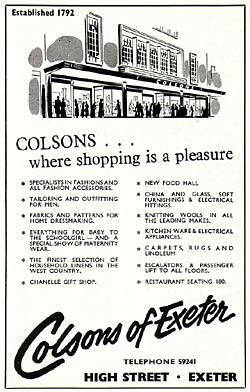 Colsons of Exeter, first opened in 1792 selling tea and silk - it was taken over by Harrods in 1969 and renamed Dingles and now the House of Fraser. 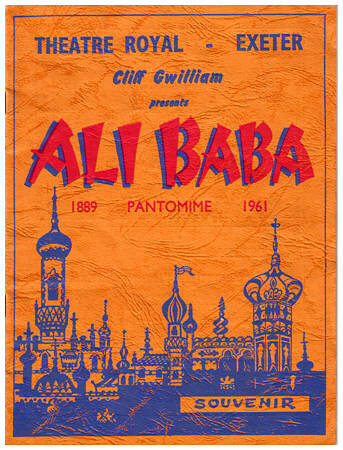 The programme for the 1961 pantomime at the Theatre Royal. 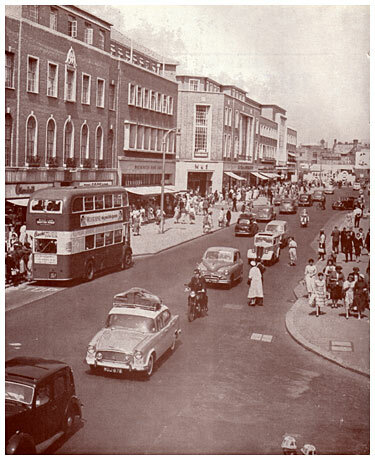 This was the last panto at the theatre as it closed in 1962, to be replaced by an office block. The second photo shows the theatre, in 1962, just when the roof was being removed. The iron girders of Debenhams are rising on the right corner. Photo courtesy Aubone Braddon. Exeter Schools' Octocentenary Celebrations 1962 Those who went to school in Exeter in 1962 may have been involved in this celebrations. 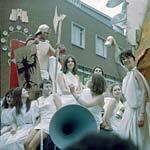 It was put on in May 1962 to celebrate 800 years of local government in Exeter. There were exhibitions, dramas, an historical pageant and a procession through Exeter, put on by pupils from all the schools. 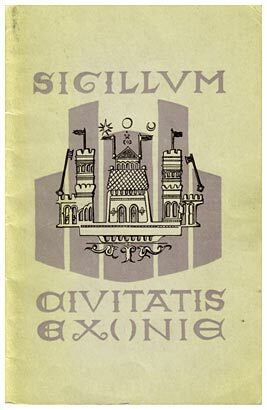 The cover for the programme translates as 'the seal of the city of Exeter'. 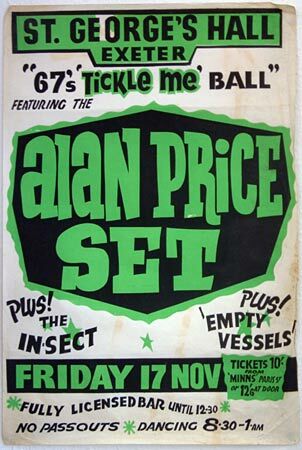 The Alan Price Set played at St Georges Hall on 17th November 1967. 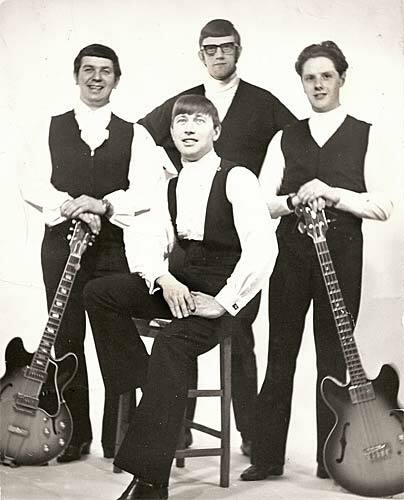 For those too young to remember his 'Simon Smith and his Amazing Dancing Bear' Alan Price had been the keyboards player in the Newcastle band, the Animals. He found touring with the Animals difficult because he didn't like flying, so he formed his own band, the Alan Price Set. Five piece local band Sounds Unlimited pose for a photographer. 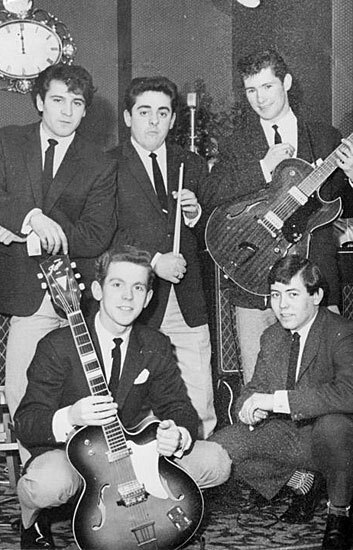 I don't know much about them, so if you can help me add some info on the band please Contact me. Photo Bob Brassett. The Rolling Stones played on 26th August 1964 (2 shows at the ABC) and on the 2nd October 1964 (2 shows at the Odeon). 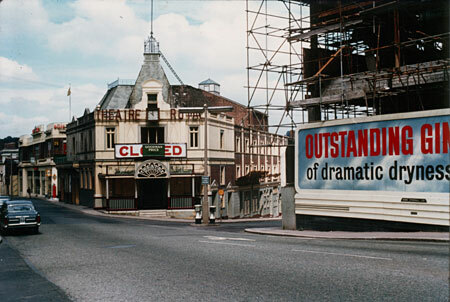 The Odeon had just spent £6,000 on new dressing rooms and enlarging the stage. 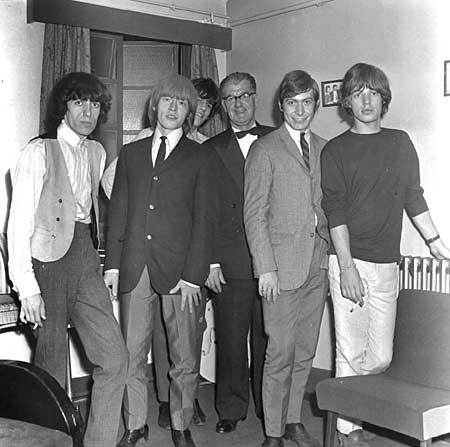 The rare photo of the Stones, with the manager of the ABC, Robert 'Bob' Parker, was taken backstage at the ABC 26th August show. 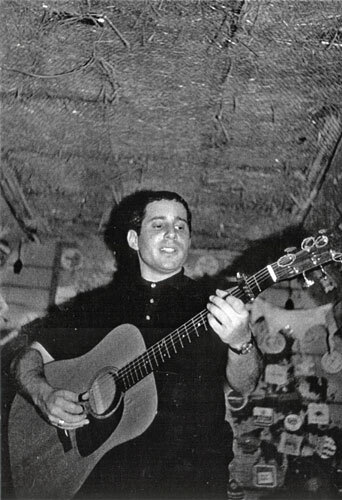 Paul Simon visited Exeter in 1965 (probably July) and played a gig for a party in a barn at Newhayes House, Cowick Lane. He had spent 13 months touring England, passing through Exeter. Chris Runciman, one of the organisers, remembers the opening act was the short-lived Dalliance Minstrels of Tom Mason, Sue Turner, Chris Runciman and Chris Roach who sang bawdy 17th century songs. 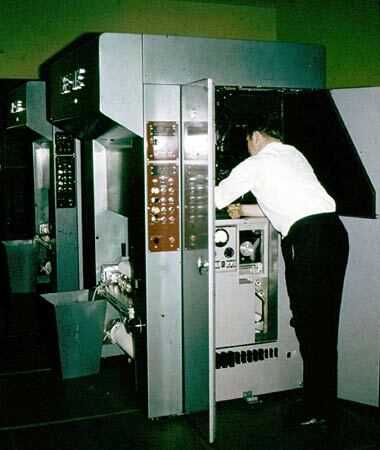 Simon was paid £5 for his performance and was recorded on a reel-to-reel Grundig tape recorder. The recording was played on a BBC Radio 2 programme entitled Mr. Simon’s Big Trip, on 5th June 2007, when Bob Harris played an unheard song called, The Northern Line (song)Some remember him playing at the Exeter Folk Club at the Jolly Porter, others say he played in the basement of Head Weir House, but there is some disagreement as to whether he did, or not. Photo courtesy of Bob Brooks. Led Zeppelin. 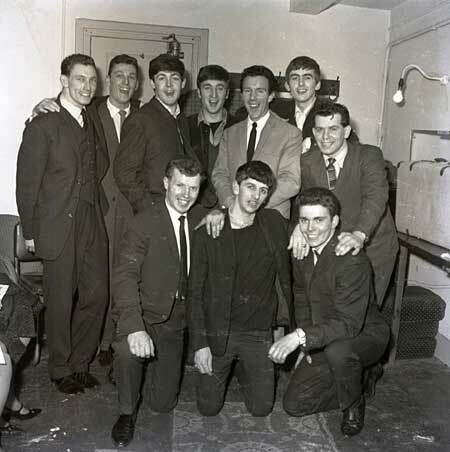 Civic Hall Exeter 19th December 1968. The Who. Exeter University 17 March 1967. The Maritime Museum opened in 1969. 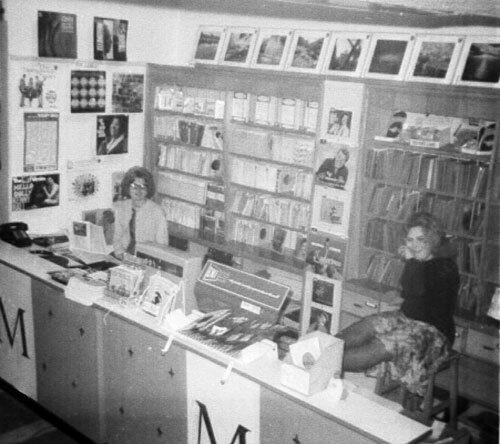 The museum was forced to close in 1997. 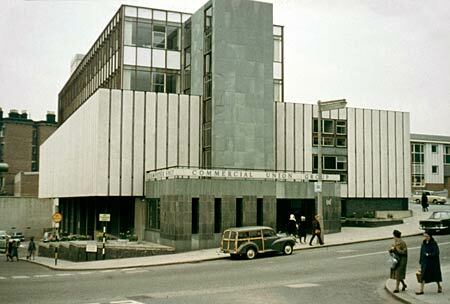 Exeter Central Library re-opened on the 22nd October 1965 after the original library was destroyed in the blitz. In 1961, Jimmy Edwards, the actor, visited the Prospect Inn on the quay to knock over a pile of pennies that had been collected for the Vranch House School.